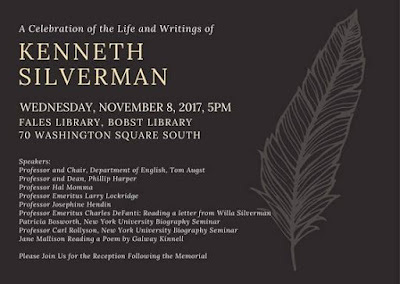 There will be "A Celebration of the Life and Writings of Kenneth Silverman" tomorrow, November 8, at 5PM at the The Fales Library, Bobst Library at New York University. Among his many achievements, Dr. Silverman was the author of what is still (IMHO) the finest Houdini biography ever written, Houdini!!! The Career of Ehrich Weiss. Ken Silverman at the CJM: "Houdini was the first modern magician." 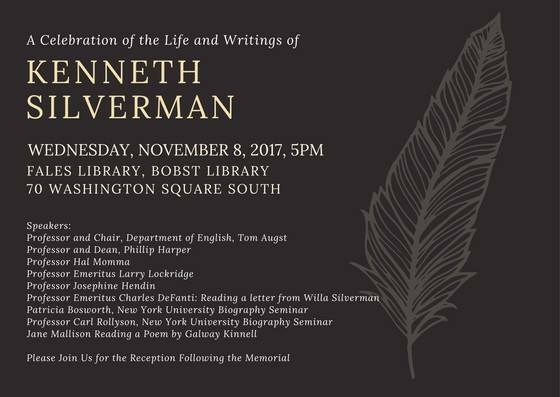 "Among his many achievements, Dr. Silverman was the author of what is still (IMHO) the finest Houdini biography ever written, Houdini!!! The Career of Ehrich Weiss."